A man is wrongly convicted of conspiracy to commit espionage against the U.S. He's offered his freedom if he can rescue the president's daughter from an outer space prison taken over by violent inmates. 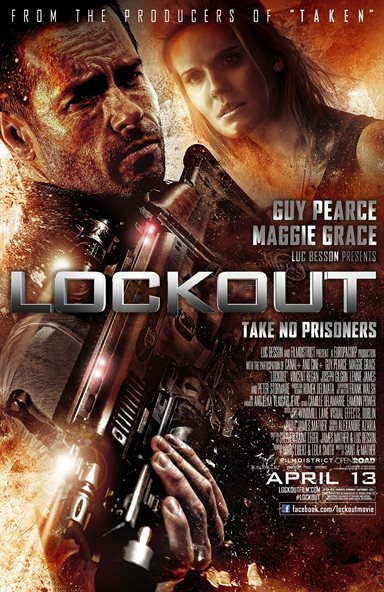 Download Lockout in Digital HD from the iTunes store. Lockout images are © FilmDistrict. All Rights Reserved. With a mixture of tongue in cheek comedy and sci-fi action Lockout does an average job of entertaining male teens through adults. The fast paced film reminds me however, of Escape From New York another futuristic film that features some very mean characters and a lot of brutality. Lockout features some very mean looking characters so it's hard to recommend it to the ladies. The story plays out like this; Snow (Guy Pierce) gets convicted wrongly of murder and gets sentenced to prison. Before he can get there he is offered a deal of freedom if he can rescue the President's daughter Emilie (Maggie Grace) from some extremely dangerous convicts who have taken her hostage at an experimental prison in the sky. Even though the film may be familiar to those who have seen the film Escape From New York where Snake Plissken has to rescue the President being held by some very evil convicts in a prison city in return for his freedom, Lockout's space setting does change it up a bit. That said, Guy Pierce of Lockout reminded me a lot of Kurt Russell who both have the starring roles in the similar stories. Much like Russell, Pierce plays a very loose cannon winging the rescue of Emilie while dealing with death at every turn. Both actors take time to add some comic relief during the intimidating scenes. The setting, an experimental space station prison circling Earth, gives the film a futuristic feel especially the cryogenic cells in which the prisoners are kept. Directors James Mather and Stephen St. Leger do their best to utilize the whole platform, but in most cases they keep the action confined to corridors and a holding area that turns the film claustrophobic at times. It's their first major outing and a tough choice especially trying to overcome the simple storyline and make it into something it wasn't. The CGI shots of the huge interior separated by a cavernous middle keep the film Sci-fi, but set in the year 2079 you would think some space bots and hover ships would have worked nicely to work as transporters. The spaceship fighters are reminiscent of Star Wars and the prison itself could have easily been a part of the set of 2001 A Space Odyssey. The firearms are not very imaginative and amount to ordinary arms that we use today rather then some sort of special weapon or stun gun. The film has been rated PG-13 by the MPAA for intense sequences of violence and action, and language including some sexual references.